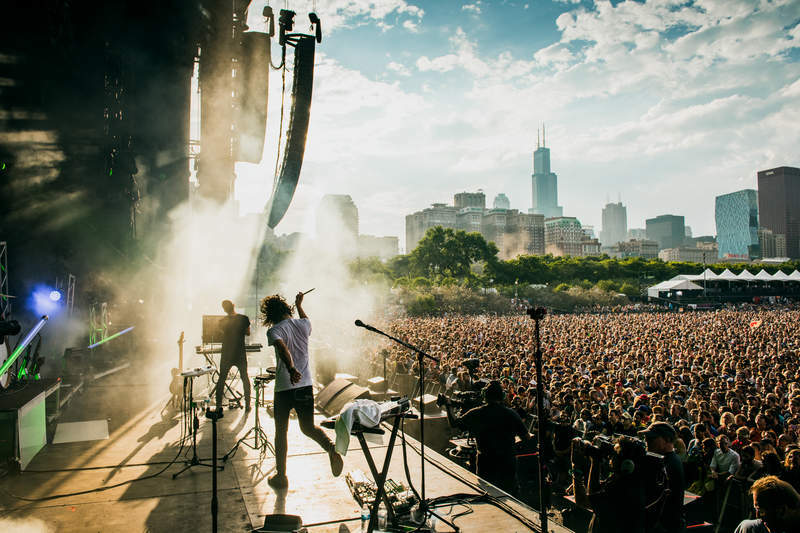 For the past decade and change, Chicago has been flooded with out-of-towners in the late summer for Lollapalooza, the four-day weekend filled with every notable musical act you'd feasibly want to see live in a given year. Lolla 2017 is hardly any different: during August 3-6, some of our favorite current bands will grace the festival's many stages, both big and small. But newbies beware, this isn't just a waltz in (Grant) Park. As any vet will tell you, you'll have to battle large crowds, plan out your schedule, and feed yourself in between it all. We're here to take out some of that guesswork. If you're looking for a last-minute ticket or a bangin' after-party show to hit up (playlist included), look no further than our go-to guide below. Since Lollapalooza sells out in minutes before the schedule is even announced, traditional means of ticket acquisition are out. You can try to enter various contests to win tix but if you’re not the gambling type, you’re probably gonna have to eventually bite the bullet and go with a broker. Four-day passes are currently going for around $300 on sites like StubHub and Vivid Seats, which is actually not that bad a deal. VIP options are also currently on the secondary ticket marketplace, which get you amenities like multi-level viewing platforms, expedited entry, shaded bar lounge areas with craft beers and cocktails, free food from Big Star and Publican Quality Meats, air-conditioned bathrooms, lockers with cell phone charging units, and, yes, a massage tent. But our favorite perk is easily the golf cart shuttle transportation that takes you from one side of the park to the other in minutes. Unlike many festivals, Lolla lets you enter and exit up to three times a day, provided you get your wristband scanned on the way in and out each time. They frown upon loose wristbands that can be slipped off, removing them between days, or general tampering. If you happen to legitimately lose yours, they can replace it for $25. If you register your wristband in advance, you can sign up for Lolla Cashless, which charges your credit or debit card for on-site purchases. Getting to the park at the same minute as tens of thousands of others turns into a shitshow at peak hours. A cab or ride share will get you there, but most people opt for public transit. Any CTA line will get you downtown, but the Red and Blue Line Jackson stop is closest to the main entrance. If you’re riding the Metra, the Van Buren stop on the Electric Line is located within the park. Uber or Lyft is typically a bit cheaper than cabs in Chicago (although peak Lolla times are inevitably prone to surge charges), but you can get $15 off your first ride Uber using the code RIDE2LOLLA. There is also a range of shuttle options -- try this helpful site where you can enter your address to find the closest one. If you insist on driving, you can park at garages near Grant Park (though you’d be wise to reserve a spot in advance). The most fun way to get to Lolla is by bike (provided where you're staying is within biking distance). There is bike parking outside the main entrance, and local bike rental joints are offering discounts for out-of-towners, although you could just as easily participate in Chicago’s public bike sharing program, Divvy (check their site for locations). Billy Goat Tavern for its SNL-made famous "cheezborger"
For those who can’t wait for Lolla to kick off, you can wet your whistle early with a tasty pre-festival treat in the form of a performance by iconic Austin indie rockers Spoon at Metro, the top venue in the city that's seen its fair share of stories over the past 35 years. For those looking for a more psychedelic experience with British attitude, point the GPS toward Temples at Lincoln Hall. If you’re looking to see a local band that everyone but you is already talking about, check out Chicago indie rock darlings Whitney at Thalia Hall, a beautiful restored historic landmark in the Pilsen neighborhood. If you’re jonesing for more of a party-starting, EDM-flavored affair, work the dance floor with darkly manic electro-punks Crystal Castles at Lincoln Hall. Transitioning from underground favorite to headlining act this year, Canadian oddball indie rocker Mac DeMarco will close out Friday night with an intimate set at Concord Music Hall. Check out Warpaint at Subterranean if you're in for a set of moody art rock by a quartet of badass women from LA. The Vic is the place to catch near-perfect indie band The Shins, who are as easy to like as they are hard to find fault with. Car Seat Headrest at Lincoln Hall is where you’ll experience the spectrum of Will Toledo's work as an already prolific songwriter that spans from lo-fi gems to full-band rock 'n' roll headbangers. If you’ve got anything left in the tank by Sunday night (kudos if you do), The Head and the Heart at Metro will provide the perfect comedown from the weekend with their soft folk harmonies and gorgeous, lush melodies. Or you could go in the complete opposite direction and see EDM kingpins Zeds Dead at Concord Music Hall and call in sick Monday. Jay Gentile is a Thrillist contributor and lifelong Chicagoan who has been to every Lollapalooza since it moved to Chicago in 2005. Follow @innerviewmag. Dan Jackson is a staff writer for Thrillist Entertainment. Follow him @djackson.